We love trying out new Lego, but the latest range had us scratching our heads a bit. The first Lord of the Rings film was released in 2001, yet its accompanying brick-based merchandise only hits the shops this month. Could this be a way of buttering up the kids in preparation for the new film The Hobbit which is due out soon? Still, better late than never. In preparation for tackling the review kit the Lego people sent us of Gandalf Arrives (#9469), we cracked open our DVD of The Fellowship of the Rings. When you compare the two you can see that they’ve done a pretty good job of reimagining the film in brick form. 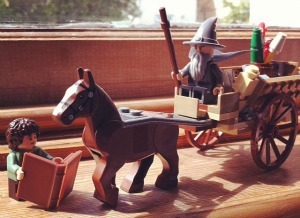 As well as Gandalf, the set includes a cute little Frodo mini-minifigure, a nicely formed horse and a chariot full of fireworks for the party. It’s an easy one to put together, and we had it completed quicker than a trip to Mordor, in under 15 minutes. We particularly like that the horse has jointed legs which he can rear up on – useful if you’re trying to scare off someone who’s after your ring. This is the smallest set out of seven in the Lord of the Rings Lego range and retails at £11.99, though for some reason Amazon currently have it priced from £19-£30. I know it’s precious, but that is really taking the Gollum. Argos are currently showing it in stock at a much more hobbit-sized £11.99, which I think is about right for this 83 piece set. LEGO Lord of the Rings is suitable for children aged 5-12 and will be widely available in toy shops from August 2012. So how do you go on holiday to France then? Working + School holidays = ??? looks like a really good set…and great vlog! ooooh that looks great. I haven’t spotted any Lord of the Rings LEGO yet. Thanks guys! The picture is a bit wobbly because it was filmed by my daughter on a very small hand held camera, but I still like it because it’s nice to see what the kids think.